Zooming down U.S. Route 1 on the Florida Keys, my face shield open, I look up momentarily at the cloudless sky. Three pelicans fly overhead. To the left and right nothing but turquoise ocean, bordered by low green shrubbery. Three colors — blue, green and light gray pavement — swoosh past, and I have one thought. This is as close to flying as one can get without having wings. This is why God made Route 1 and motorcycles. Behind me and to the left edge of the lane is my friend Leigh W. He’s on a rented Harley, same model as mine. I’ve known him since we were 18 and freshmen in college. That was 44 years ago. 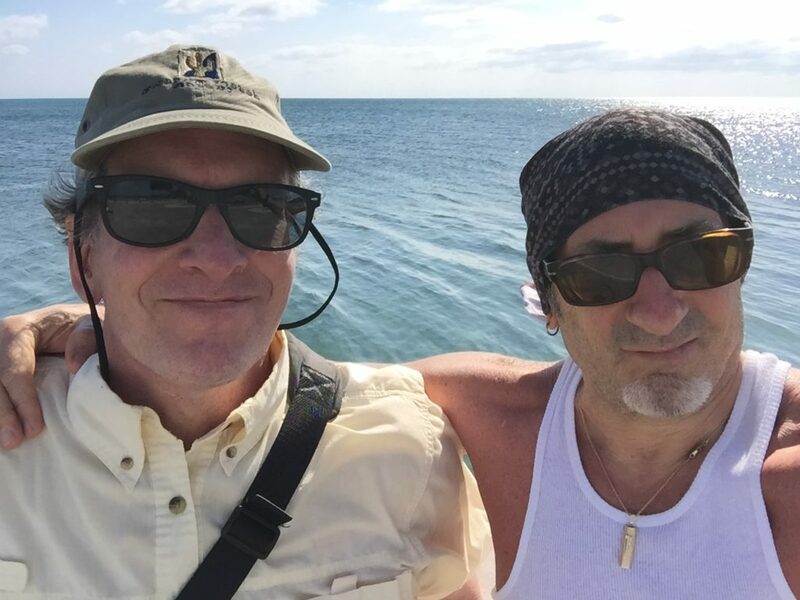 When he learned a couple of years ago I was going after a motorcycle license, he decided we would ride together to Key West on cruisers, as befitting the 60-plus year old guys we’d become. Leigh’s been riding since before I met him. But he’d never been on an overnight motorcycle trip. I’ve only had my license for two years. But this was my fourth overnight trip. Our experiences complemented one another. He’s a Yamaha sport bike rider. I’ve got a 2018 Harley Davidson Heritage Classic. A Classic for a classic ride down U.S. Route 1. Our bikes reflect ourselves. Personality-wise and in a lot of other -wises, we’re the two most unlikely guys to have a lifelong friendship. Yet we do. Still, six years had passed since I’d seen Leigh, when he attended my son’s wedding. The Auto Train is an adventure in itself. Reading a while, then a double Scotch in the rocks in the nearly-empty lounge car. Then a surprisingly pleasant dinner in a dining car, seated with talkative strangers. 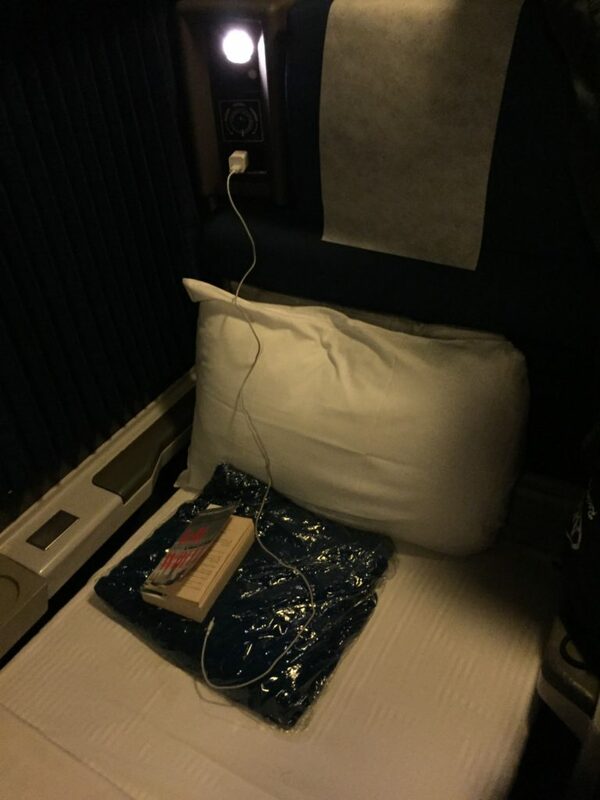 Then, tucked into my narrow “roomette” — which the porter converted from sitting room to bedroom while I had dinner — I read and tried to sleep as the train lurched and swayed through the night. The next morning, after backing my bike down off the carrier and reloading everything, I headed out of the Sanford, Florida station and hit Florida’s I-4 for the run to St. Pete’s. (The bike roared to life, no problem, thanks to transport mode.) What a difference a 17-hour train ride straight south made! The Orlando area was warm and sunny, weather I enjoyed all the way to St. Pete’s. Arriving about 1 p.m., I had a joyful reunion with Leigh, his wife, son and daughter-in-law, and father- and mother-in-law. The only person I wasn’t long acquainted with was Leigh’s new granddaughter. Holding her, I thought, wow, from dorm freshmen, to best men at one another’s weddings, to playing with one other’s kids, to attending their weddings, to holding my old buddy’s gorgeous granddaughter. How great that motorcycling, of all things, would spark a wonderful reunion! 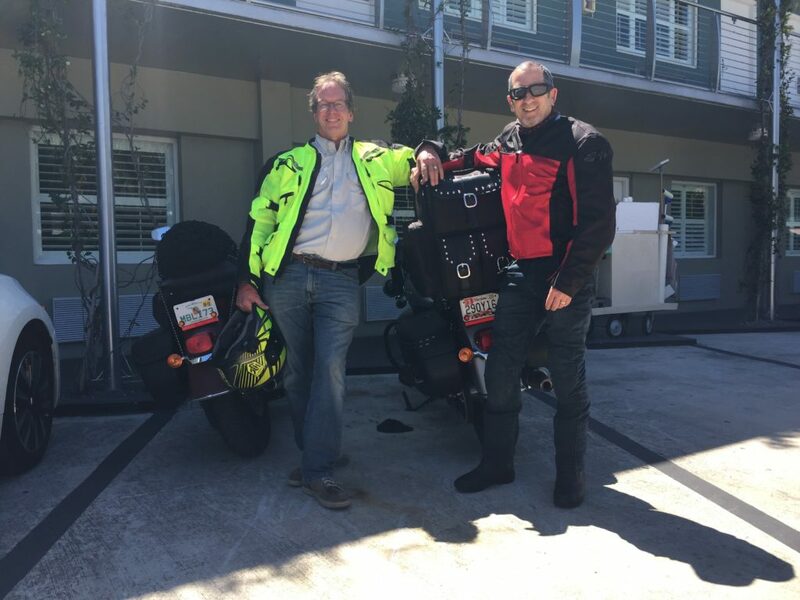 Next morning, after Leigh’s family served us up a hearty breakfast of chicken sausage, scrambled eggs, danish and coffee, I followed Leigh and his son to the Bert’s Barracuda Harley Davidson dealership in St. Pete’s, where Leigh rented … a 2018 Heritage Classic. Soon we headed out of the Tampa/St. Pete peninsula, flying over the spectacular Sunshine Skyway Bridge. Equally spectacular was the weather. I nearly stood up on my floorboards and waved my arms. 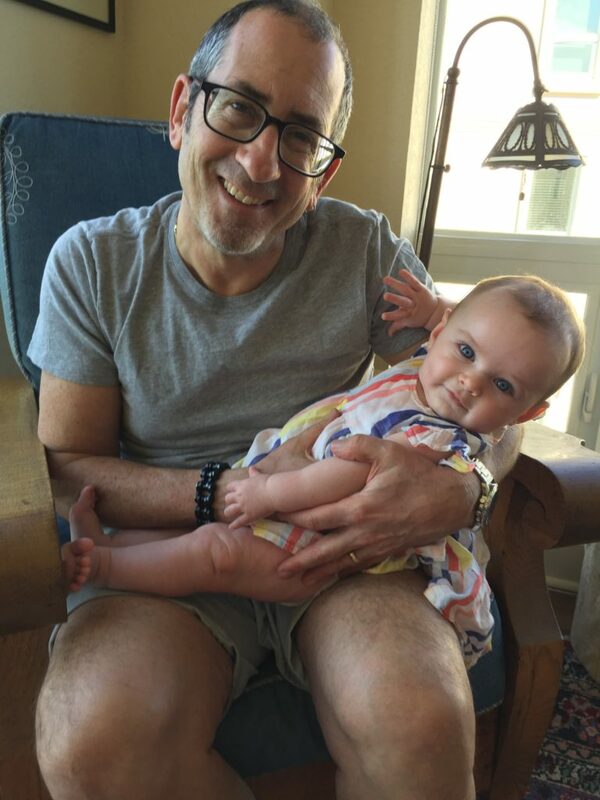 Nothing like holding an old friend’s grandchild, ‘specially one this cute. On advice of the general manager at Bert’s, we hightailed down I-75 to avoid countless traffic and traffic lights. At Naples we detoured over to Marco Island for a look-see. Passing in an out of the affluent little downtown, we found a back road off the island that ended on U.S. 41 — at the point it becomes the famous Tamiami Trail, a/k/a Alligator Alley. Great segment with light traffic. We rode past lush tropical-looking woods dotted with touristy Indian villages, alligator lookouts and airboat ride docks. The ride turned tedious when, reaching Miami/Dade county, we turned south onto local route 997 to avoid hitting U.S. Route 1 in Miami at rush hour. But 997 is undergoing a miles-long widening, rendering it a seemingly endless stop-and-go. There’s nowhere to pass. As it does in South Florida many afternoons, the sky clouded over. Soon the rain started. We pulled into a gas station under one of its massive overhangs. A dozen other riders were huddled under the adjacent canopy. With the rain getting steadier, and knowing we were only miles from our first-night destination of Homestead, we found a motel online, donned rain gear, and headed out into the soup. Soon the widening project yielded to a reasonably flowing road. And the rain vanished as fast as it had come on. Minutes later, we spotted a little street called Mowry. A left turn, a dart cross Route 1 and there was our motel, the faded but friendly Garden Inn. We got a second-floor catwalk room — meaning we had lots of railing footage on which to hang stuff to dry. Later we crossed Route 1, on foot, in search of dinner. We spotted a placed called the City Hall Bistro and Martini Bar. It’s in a 1904 hotel. We had drinks and dinner on the porch, from which you can see the impressive Homestead city hall in the distance. Right across from our table was a run down transmission shop with a decaying boat up on blocks. My kind of corner, I thought, sipping a nicely made perfect manhattan on a quiet block of small business and old houses — a corner few Florida tourists frequent, you can be sure. Next morning, after breakfast provided by the motel, we hit the road early. Heading south on U.S. 1, within a couple of miles I spotted a sign that said, “Key West 122 miles.” That didn’t see so far! And a beautiful ride it was. Smooth sailing, mostly two-lane roadway close to the water with the occasional rise of a bridge. In between the causeways traffic would slow as we crossed the Keys towns above Key West. Somehow, people didn’t seem frantic to pass or get around one another. I liked the relaxed pace of 55 mph to 65 mph along this route, the better to take in the gorgeous scenery. We enjoyed perfect weather, temperatures a relatively mild 80 or so and low winds. Reaching Key West, Route 1 becomes Truman Avenue. Near the end is Simonton Street, where we pulled into the Blue Marlin Motel. It’s a short block to the bustle of Duval Street. Within an hour we were baking by the pool, our bikes cooling off in our assigned parking space. Immediately it became apparent that where most cities have pigeons, Key West has chickens. Colorful roosters strut around everywhere. The Blue Marlin doesn’t have a bar, but the Tipsy Rooster Liquor Store and Bar is right across the street, just steps away. In laid back Key West, no problem walking across the street with a cup of beer or a cocktail. The Southernmost Deli is steps around the corner if you want to add potato chips. The Blue Marlin’s rooms are large, airy, well lit with large windows, and feature what look like freshly renovated baths and furnishing. And the world’s best shower head. I noticed several other motorcycle groups had checked in. In the space next to us squeezed a Harley Trike, Road King and Low Rider. Arrival at the Blue Marlin Motel in Key West, after classic ride down U.S. Route 1. 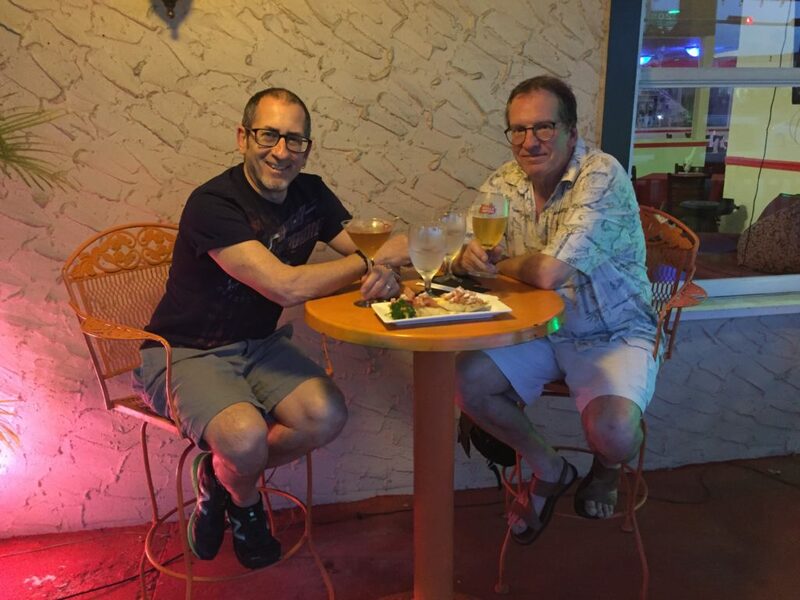 We had dinner at the Banana Cafe on Duval Street. It looked touristy to me but my pan roasted yellowtail snapper was awesome. Leigh had fried fish ‘n’ chips, of which I tried a tasty chunk. We sat by the large opening right above the sidewalk. Great people watching. Key West draws a little of everything — families, groups of assorted young people, elderly couples. Right next to a bar featuring a traditional singer with guitar, you’ll find a night club with a heavy set guy in drag inviting you to the late show. We passed on that one. 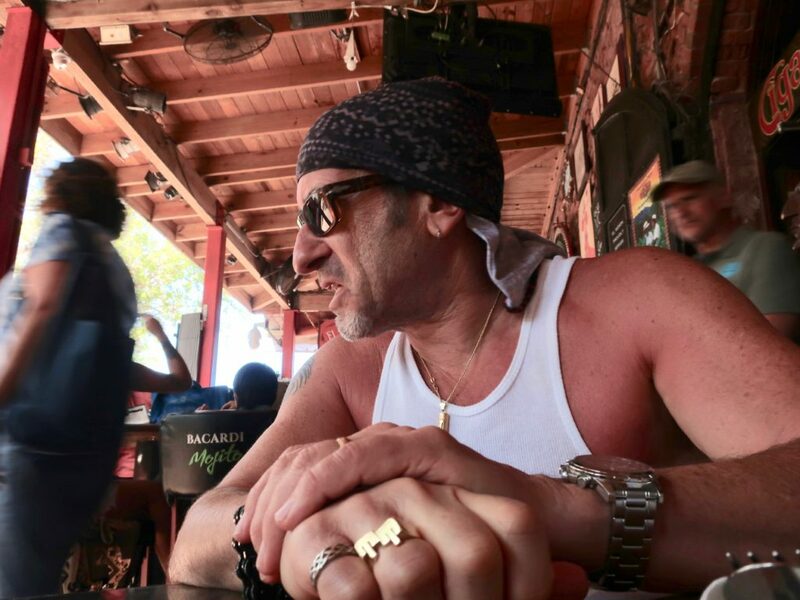 Later, while Leigh fiddled with the photographic and navigational gadgets he loves to carry around, a tangle of cables and charges on his bed, I strolled further down Duval Street, ducking into an uncrowded pub for a martini, watching early season baseball games. The next day in Key West we left the motorcycles parked. We walked along the beaches on the south edge of the island, heading out to the ends of two piers. Then we walked the length of Duval Street, poking in jewelry shops for gifts for the wives. Then lunch in a large Cuban restaurant adjacent to the cruise ship dock. Only one ship was in that day. We chatted with a couple sitting nearby, who’d stepped off that ship. The husband turned out to be a rider, and showed us on his phone a picture of a beloved but nearly unrideable custom chopper he’d owned. Thursday morning we departed Key West by 8 a.m. The day, although sunny, was marked by sharp, gusty winds. The northbound return on Route 1 didn’t feel nearly as relaxed as the ride down, buffeted as we were by the crosswinds. I was ready for the final causeway to Florida City and Homestead to be over, lest the bike be blown into the ocean. As we exited the Keys, a slight rain developed. We pulled into a motel parking lot to see if we’d need rain gear. This was also just a few hundred yards from where we were to part company. Leigh was headed north and west back to St. Pete’s. I was headed up the east coast to spend the last night in Florida with my wife’s aunt and uncle in Port St. Lucie. I decided to just do rain pants. We waited, reluctant to say good bye. The rain never really developed. So we hugged, put our helmets back on and headed back out to Route 1. Leigh went straight, I veered off to the right onto the Florida Turnpike, which eventually swings right through Port St. Lucie. Seconds later our bluetooth headsets lost the connection. I thought about what a great few days we’d had. Weather, food, scenery, tearing up the Florida roads on our Harleys. Most of all, spending time with someone I can talk to about anything, and vice versa. The Florida Turnpike is efficient but no fun. The wind continued. I was comfortable at 70 mph. The cars mostly seemed to go 80. At one point rain did develop. For the first time in my short riding career, I became that guy under the overpass putting on the rest of my rain gear. Now the traffic was fairly heavy, so I had to time my entrance back onto the travel lanes, maneuvering over gravel, those perpendicular warning ridges dug into the shoulder, and travel pavement about an inch higher than the shoulder. What a place to wipe out, I thought. But the Heritage handled it all with aplomb. And the rain let up 20 minutes later. Bored with the Turnpike, at the lower part of Ft. Lauderdale I exited onto Florida 441, a north-south road just west of the Turnpike. I remembered it as a two lane, easy road flanked by farms and woods. But in the years since I’d visited South Florida regularly, it’s become a thoroughfare. Development that at one point ended at the Turnpike has spilled west right over the Turnpike as central Florida becomes covered with shopping malls and instant communities with Palms, Lakes or Isles in their names. Now 441 is a 65 mph local road, with traffic lights every couple of miles. By Southern Boulevard in West Palm Beach I returned to the Turnpike for the last 40 miles or so to Port St. Lucie. My uncle insisted I keep the motorcycle in his garage. My aunt prepared a dinner practically as if it was Thanksgiving. The next day I started out for Sanford on I-95, which is only a mile away from the Turnpike at Lucie. At Cocoa Beach, a big traffic jam. I pulled off to try and go a little east to Route 1. Another traffic jam, stuck behind a long trunk hauling a giant, horizontal tree. I ducked into a local neighborhood, pulled out my phone and let Waze rescue me. Another 40 minutes later I was in the back streets of Sanford, a sort of forlorn town, and pulling into the Amtrak station. A long line of cars waited at the gate. But an attendant came up to the bike and motioned for me to bypass all the cars and go directly to the motorcycle staging area. A big BMW K-1600 was already on the carrier. Waiting outside and watching the activity, I saw one other motorcycle pull up. Auto Train roomette is cozy and private but it moves a lot. Reverse overnight trip. This time I had a double Jack Daniels in the lounge car, and the fish instead of steak for dinner. 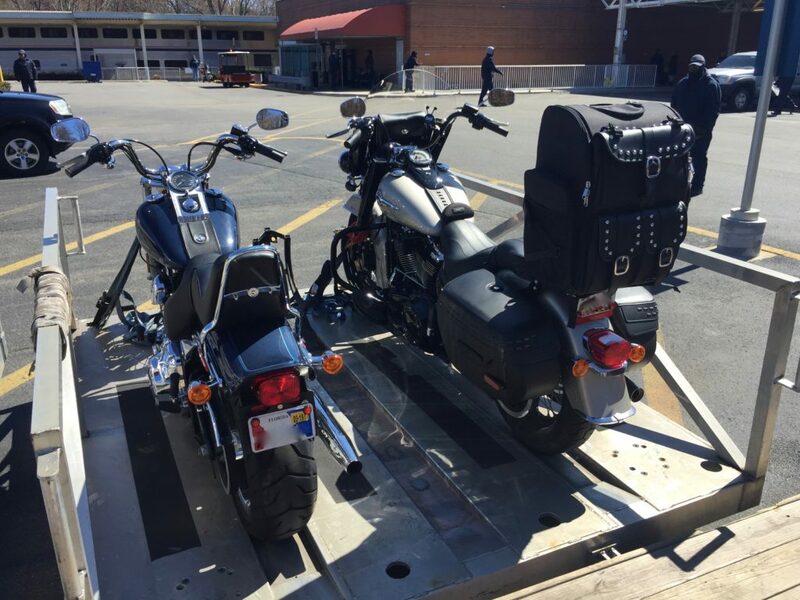 Saturday morning, I waited about 45 minutes for the bikes to offload. Riders can wait away from the car crowd in a special area with benches. The K-1600 guy was also waiting. He’d been given this bike by a friend who was moving to Thailand. I-95 was positively crowded between Lorton and the Beltway. So was the Beltway. When I finally pulled into the driveway, my trip odometer showed 1,079 miles. Not a super amount of mileage for a six day trip, but what great mileage it was, mostly. The bike was filthy from the brief rain periods, so I left it in the driveway to cool before washing and polishing it in the afternoon. Your trip sounds great! I’m sure you are glad you did it. 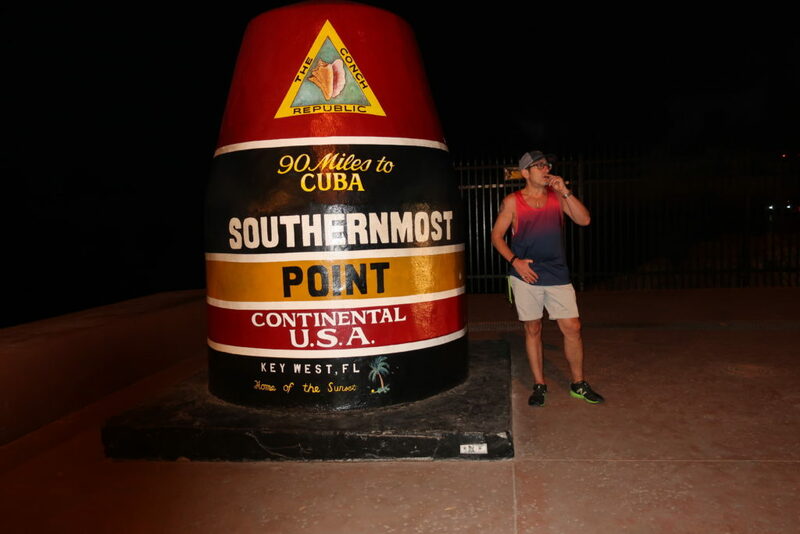 If you ever decide to do it again, please let me know because we spend the winter in Key West. I would have loved to meet you on the road and ride to Key West with you. And…you really should do it again because you missed so much: music at the Green Parrot, the famous Sloppy Joe’s, The Truman winter White House, the home of Earnest Hemmingway… Anyway, it looks like a fun trip even if you did use the turnpike and interstates. Great trip, what an adventure! Memories adn bragging rights.